EdbMails does not require any key to use the application. Upon purchasing the license,the application will automatically starts working as per your license type. Your EdbMails account has been created successfully! Use this account credentials to login EdbMails application. Note: Ensure that you have Outlook installed on your computer to perform OST to PST email extraction. How to convert OST files to PST using EdbMails? If you looking for a free OST to PST conversion software, EdbMails OST to PST conversion tool can help you with that. The OST to PST conversion freeware tool is rather simple to use and you can extract all the OST file data to Outlook PST using it. EdbMails is the best OST to PST conversion tool as it lets you accomplish the conversion in just a few clicks - browse for OST file location in the convert OST to PST program, set the PST folder destination, and then click on ‘Export to Outlook PST’. The Free version of EdbMails will be able to export 30 items from each and every folder of Orphaned OST file. The outlook OST to PST conversion tool can convert OST to PST outlook 2016 and also convert OST to PST outlook 2013, even OST to PST conversion outlook 2010 is possible. 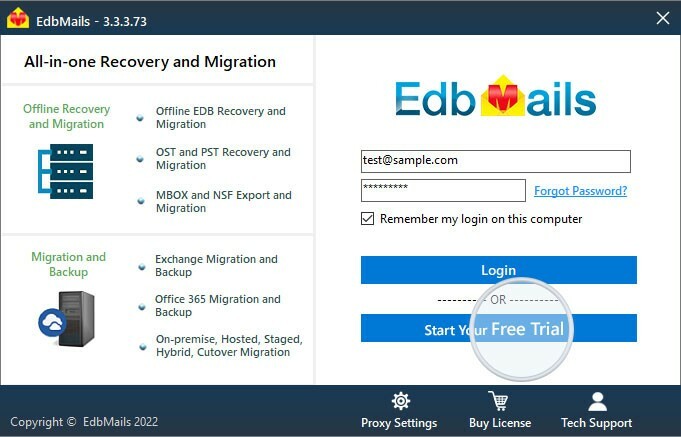 Using EdbMails, you can migrate OST file directly to live Exchange server or to Office 365 user account. It's very simple and handy to do. All the required settings and commands are given in the OST export screen itself. No technical knowledge is required to migrate OST to Live Exchange server or Office 365 account. With the exchange OST to PST conversion tool, you can recover the OST file that is disconnected with Exchange server or to an Outlook. Thanks to EdbMails, you don’t need to convert OST to PST manually, as trying to convert OST to PST in outlook can be a tedious task and may not always work. OST to PST extraction can come handy in situations like Exchange server crash or downtime. You can convert OST to PST email, all your emails, appointments, and contacts, tasks etc can be recovered and opened in Outlook after the OST to PST conversion. Backup your Exchange server data using OST to PST conversion. OST extraction will have the same original folder structure. Just by selecting the folder items during OST export operation you can export only the selected ones. Recover all data of .OST mailbox data like Emails, Attachments, Calendar Appointments, Contacts, Task, Sticky Notes, journals and all other mailbox items. No OST File Size Limitation and you can export any number of OST files. OST to PST converter Lifetime Free upgrades without any additional charges. Free 24/7 Technical support on phone, live chat and email. Recover Unicode OST files Chinese, French, Japanese etc., on OST export. The tool is used to convert offline Outlook data files (.OST) to Personal Outlook data files (.PST). Tool shall export offline Outlook data files containing Emails, Tasks, Contacts, Meetings & other outlook items and convert it to Outlook data files that can be imported into Outlook. Achieve precise OST to PST conversion preserving the original data structure, using the best OST to PST conversion software available in the market. Recovered Outlook data files (.PST) can be seamlessly imported into Outlook with least efforts as possible with a click of button. The extraction tool recovers corrupted, deleted and inaccessible sectors of data while exporting offline Outlook data files (.OST) including attachments, appointments, notes, contact, tasks, posts, journals etc to Outlook data files (.PST). Repair function of extraction tool makes sure email attributes are retained as it was before during the recovery. EdbMails tool also provides ability to store extracted offline Outlook data files in different data formats (e.g. PST, MSG, EML etc) that enables user to access recovered Outlook elements in applications like Outlook Express, Mozilla Thunderbird and many other client application along with Outlook. EdbMails OST to PST file conversion free version is available to download for evaluating the functionality. Freeware tool provides the ability to repair corrupted/damaged offline Outlook Data files along with preview data elements including attributes. Free of cost tool with no time limitation however has limitation on recovering only 30 Outlook data items from each of the folder. EdbMails extraction tool provides ability specify size limit of PST file thus enabling to create multiple PST files during recovery and export. It gives choice for cautious user to limit PST size during large offline Outlook data file (.OST) extraction. OST files are user mailbox file like PST, they are offline storage files for MS Outlook. The data is OST can become inaccessible due to several reasons like file corrupted, viruses, hardware failures, unexpected shutdown, and any other incidents. OST file can also become inaccessible if you remove the original mailbox account from the Exchange server that created it. In all these cases, the only way to recover your emails, attachments, calendar appointments, contacts, notes, and tasks is to convert OST file to PST file. For this EdbMails OST converter tool converts OST to PST accurately. Very easy Intuitive graphical user interface.